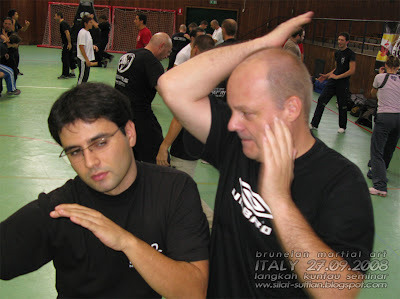 The Seminar was hosted and organized by the SSBD Italian group leader - Carlo Andreis (AMADA Gym Association) in Desenzano Del Garda, Italy. It was held in the afternoon of 27th September 2008, from 2.30 pm to 6pm. It was attended by more than 40+ participants from different parts of Europe. SSBD seminars has attracted large number of senior practitioners of different arts. 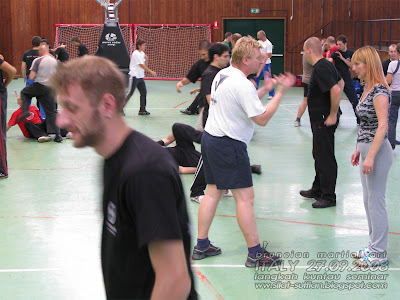 As a result 90% of the participants are Instructors and practitioners from varied martial arts styles attended, from Indonesian Silat, Filipino Kali, Escrima, Jeet Kune Do, Capoeira, Lao Long Dao (vietnamese), Wing Chun Kung Fu, Kung Fu, Brazilian Jiu Jitsu, Karate etc, left their ego at the door and came to experience, give support and exchange ideas. It was great to see old faces (friends) and welcoming the new. 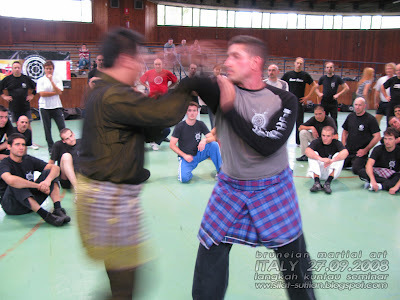 It is easy to impress people who are new to the martial arts, but to gain the interest of people who are seniors and seasoned in thier own arts is an experience like no other. Again my highest respects to them for thier openness and support. This world doesnt need people who think that know everything, such arrogance doesnt benefit anyone especialy themselves. 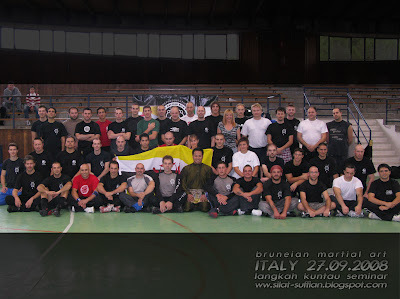 I would like to convey my deepest appreciation to all those who participated for their openess and determination to attend the Bruneian Martial Arts Seminar. To Carlo and Daniele Panni for their organizational skills, Michele Gammauta and Juan Moreno for thier excellent translation. Christian Alfano(specially for his patience), Ivano Buzzi, Alex Bombana, Michele Gammauta, Giorgio Scavino Nanetti, Enrico Bussi, Nicola Angeli, Professor Aranha and everyone who endured the responsibility as my recievers in the seminar, Marco Banfi on helping to take great video footages and everyone that helped me in this seminar and thier patience in accepting what I have taught. To those travelling from such a long way to participate in the seminar. My only hope I have not disappointed anyone who participated. My apologies if I miss anyone for whom credit was due or mistakes are made in any spelling, please contact me to correct it. 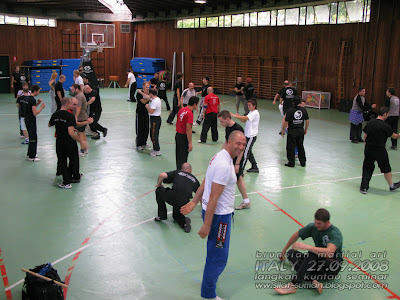 The seminar concentrated on the entries and invading footwork of kuntau in the mentality of SSBD. 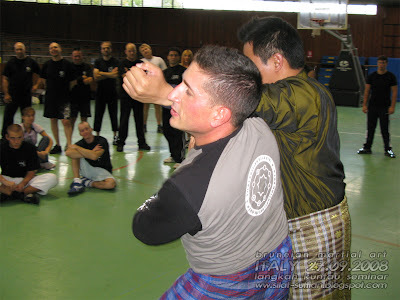 The paricipants was instructed on interception, footwork entry, body angulation, movements jamming and disrupting momentum. 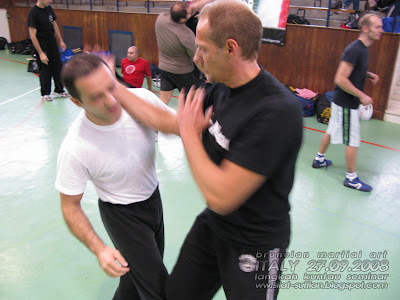 From understanding the principles above; strikes, sweeps, takedowns are incorporated. 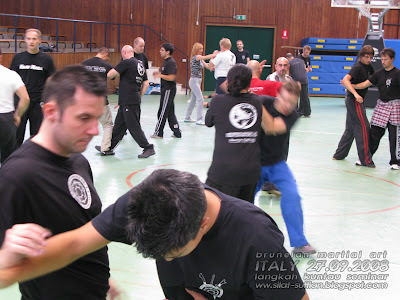 Please enjoy the pictures from the seminar below.